A dream materializes as your wide-bodied jet thunders off the airstrip, Europe-bound! Watch the sun rise up to meet your airplane, after a short night. Spain glides by beneath your airplane in shades of sienna. 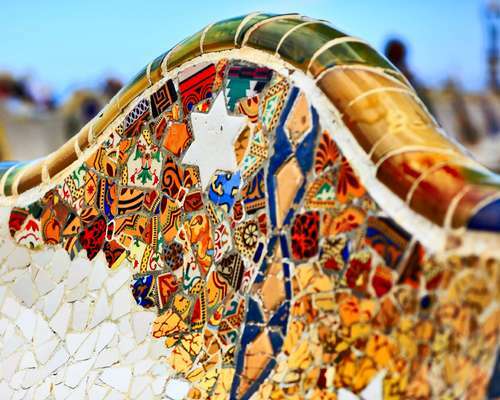 Land in Barcelona, the vibrant capital city of Catalonia and one of the world's cities at the forefront of commerce, fashion, technology, cuisine and the arts. Get set to discover the vibrant capital city of the ancient kingdom of Catalonia. Note its elegant 19th-century boulevards, parks and fountains. Settle into your hotel, then walk around your neighborhood. Practice your Spanish (or Catalan, if you can!). A tour will introduce landmarks such as the wide avenues called Las Ramblas, the medieval Gothic Quarter around the cathedral, Modernist landmarks such as the Basilica of the Sagrada Família, and Plaça de Catalunya, the lively heart of Catalonia's capital city. A half-day local guide, well-educated and specially-trained on the history and culture of the region, will accompany your group. You may choose to visit the Fundació Miró, one of the city's most exciting contemporary art galleries. Consider a visit to the extraordinary-looking Temple Expiatori de la Sagrada Familia, a basilica whose construction was planned in the 1870s. Antonio Gaudi was chosen as its architect in 1883, at the age of 31. For more than forty years, until his death in 1926, he worked to create a unique and huge sanctuary. Still far from completion, it combines elements of Gothic architecture and the tenets of the Modernista movement that are a trademark of Gaudi's work. Visitors can see his grave in the crypt and visit the museum that documents his life and work as well as the history of the sanctuary. You will visit the Museu Picasso, housed in 15th-century twin palaces, with works of the artist's Blue and Cubist periods on display. Enjoy a visit to Catalonia's holiest place, the Monastery of Montserrat, located amidst the serrated peaks of the Montserrat mountain range. Montserrat has served as a place of pilgrimage since the 12th century. After being destroyed by the French in 1811, the monastery complex was rebuilt and repopulated in 1844 and now includes quaint shops and cafés. Enjoy a funicular ride for the last leg up the mountain, which affords stupendous views stretching from the Pyrénées Mountains to the Mediterranean Sea. You will enter the Basilica to view La Moreneta (Black Virgin). This revered statue, said to have been carved out of wood by St. Luke around 50 AD, has been on the mountain since it was rediscovered in 880 AD after being hidden from the Moors. Board a flight bound for Basel, the chemical and pharmaceutical capital of Switzerland. Enjoy the motorcoach ride to the enchanting city set on the shore of the "Lake of the Four Forested Cantons." Check into your hotel, relax or set out to explore this quintessential Swiss city. 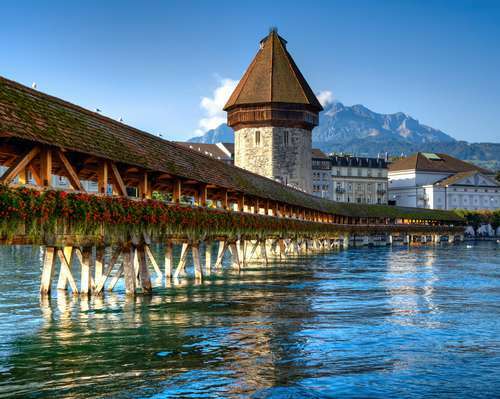 Explore Lucerne's Old Town. You may want to feed the ducks from the ancient wooden Kapellbrücke (Chapel Bridge). Pause at Thorvaldsen's Lion Monument (or Lion o\df Lucerne), near the remarkable Glacier Gardens. See the large and noble Jesuitenkirche, one of the landmarks that explain why the rural alpine areas in central and southern Switzerland remained Catholic following the Reformation. More majestic scenery awaits as you travel across Switzerland's historic cantons to the postage stamp-sized Principality of Liechtenstein. A fragment of the former Germanic Confederation, it became a sovereign state in 1719, but now functions as an economic satellite of the Swiss Confederation, to which it is linked by monetary, posta,l and diplomatic conventions. Enjoy a photo stop in Liechtenstein's capital city, known for its Postage Stamp Museum! Travel through Austria's Arlberg Alps, to Maria Theresa and Maximilian's Tyrolean capital of Innsbruck. The city's historic center is concentrated in a few small blocks. Your tour director will introduce landmarks such as the Hofburg Palace (summer residence of the Hapsburg monarchs), the cathedral, the Little Golden Roof, Maria-Theresien-Strasse, and the rococo-style Helblinghaus. Keep your camera ready as you travel to Ettal and the palatial cottage of King Ludwig II of Bavaria, nestled in a valley of the the Ammergau range. Discover with your guide a 19th-century rococo palace with lavish apartments that reflect King Ludwig's longing for the opulence of the 18th century. Within the Linderhof Park, you'll come across pools, waterfalls, and terraced gardens inspired by the Italian Renaissance. Arrive at the "Passion Play" town of Oberammergau. 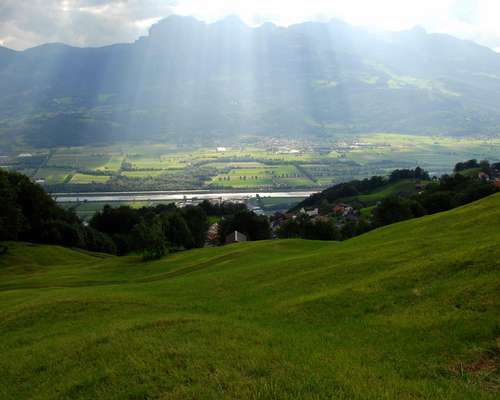 Travel to the small town of Steingaden, located along the Alpine Road. Enjoy a visit to the Wieskirche (Church of the Meadow), a fine example of rococo architecture. The plain stucco exterior gives little hint of the stunning interior. 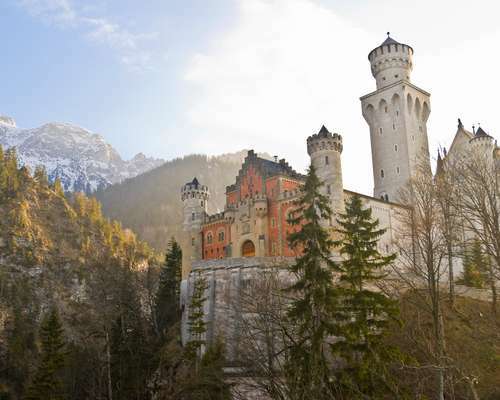 Enjoy a guided visit to the dream castle built by Bavaria's "mad" King Ludwig II. About Neuschwanstein, the model for Walt Disney's Sleeping Beauty's castle, it is said that Ludwig employed a stage set designer rather than an architect. The result is pure theatrical fantasy, stimulated by the King's fancy for Wagnerian music: from artificial grottoes to ornate rooms to dazzling views of the Alps from the belvedere. 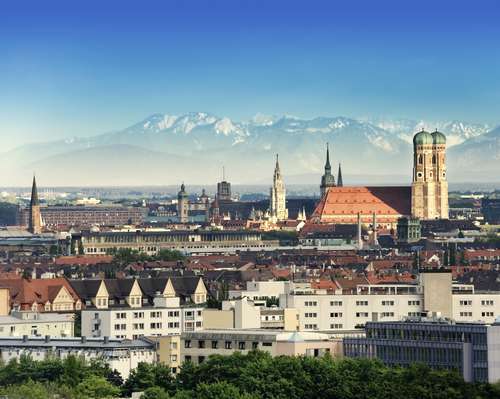 Travel to Munich, the capital of Bavaria. You'll be struck by your first impression of Munich and its landmarks, which have been beautifully restored to their pre-war conditions. A sightseeing tour in München takes you around the impressive Theresienwiese, site of the famous annual Oktoberfest. In the center of the city discover the grand set-piece boulevards of the Ludwigstrasse and Maximilianstrasse with their Neoclassical palaces, and the monumental Feldherrnhalle where, in 1923, Hitler failed in his attempt at the coup d'état known as the Munich Putsch. See the student area of Schwabing, Königsplatz, the Residenz, the Frauenkirche, whose 300-foot-high onion-domed towers symbolize the Munich skyline, and the historic Marienplatz. The tour ends with a performance of the red-coated mannequins in the Town Hall Glockenspiel. A half-day local guide, well-educated and specially-trained on the history and culture of Munich, will accompany your group. Visit Nymphenburg Palace, once the summer residence of the Bavarian sovereigns. See rooms decorated in their original Baroque style from the 17th century, as well as Rococo and Neoclassical decor. The gardens were landscaped in the 18th century by an employee of André Le Nôtre, who designed the gardens of Versailles. Set out for a town located a mere twelve miles from Munich. Visit KZ-Gedenkstätte Dachau, the somber concentration camp which has been preserved as a memorial to the victims of the Holocaust. The town of Dachau itself, paradoxically, has long been renowned for the beauty of its scenery and the gaiety of its summer festival. Memories of clean cities and fast, sleek automobiles all blur together as you bid auf Wiedersehen to Germany at Munich's airport. Your suitcase filled with memorabilia, arrive home later today, eager to share your discoveries with family and friends.